The Remote Power Reboot Switch allows you to remotely reboot and control power (on/off) to a server or other powered device over IP. Control via web interface, AutoPing, Telnet, or DxP (Dataprobe Exchange Protocol). Regulatory approvals: CE, UL, cUL, FCC, RoHS. The ENVIROMUX® Remote Power Reboot Switch allows you to remotely reboot and control power (on/off) to a server or other powered device over IP. Regulatory approvals: CE, UL, cUL, FCC, RoHS. Easy-to-use web interface makes it easy to control power from anywhere in the world. Access an unlimited number of Remote Power Reboot Switches from one software application. The Device Management Utility detects and displays all PWR-RMT-RBT-LC on a network and enables individual assignment of IP addresses, upgrading of firmware, and loads the web browser of any selected unit. Local ping: automatically reboots device if there is no response. Remote ping: pings a remote host and powers up alarm or connected device when there is no response. Dual password protection with separate user and administrator passwords. Optional wall mount and DIN mount kit available. Power switching: up to 12 Amps at 105-125 VAC, 10 Amps at 210-240 VAC. PWR-RMT-RBT-LC includes a 12A US line cord. 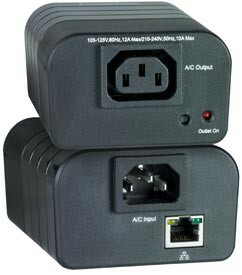 PWR-RMT-RBT-LC10A includes a 10A country-specific line cord. Optional wall mount and DIN mount kit available (MK-PWRRMTRBTLC). View/edit device and AutoPing settings. Ping up to two IP addresses. View/edit event schedules and manually control the connected device. Up to eight individual schedules events can be programmed. Events are configured with date, time, repeat, and action functions. Configure IP information (address, subnet mask, default gateway, etc.) and user administrative settings. Remote administration and control of the unit using Telnet protocol. Requires a Telnet client program. E.g. a status monitor program can be used to detect faults and then trigger a reboot when preset parameters are not met. Below are two files for running the demo script to integrate the Windows batch file with the PWR-RMT-RBT-LC. Commands can be added or modified in the script depending on the requirement. A list of available commands is in the manual. 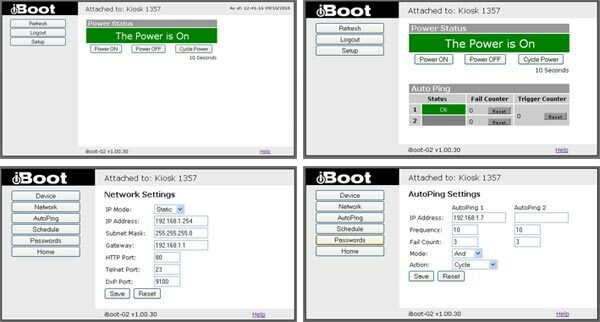 How to remotely control power on/off/reboot to a server, router, web cam, firewall or other remote device over IP.